I feel like a broken record saying I’ve had a crazy week, but well.. I just end up having crazy weeks. This week I was “recruited” to move some furniture and desks at work while some people’s offices got moved around. Sore arms, legs and back were not conducive to working out later in the day. I’m not happy about the missed workouts or the loss of running mileage although I made some of that up. So, 11 miles is not a bad total for only 2 running days. Actually more mileage then last week with 3,3,3.1… Going a little longer on Tuesday and then the long slow run around the lake salvaged what would have been a lost week. 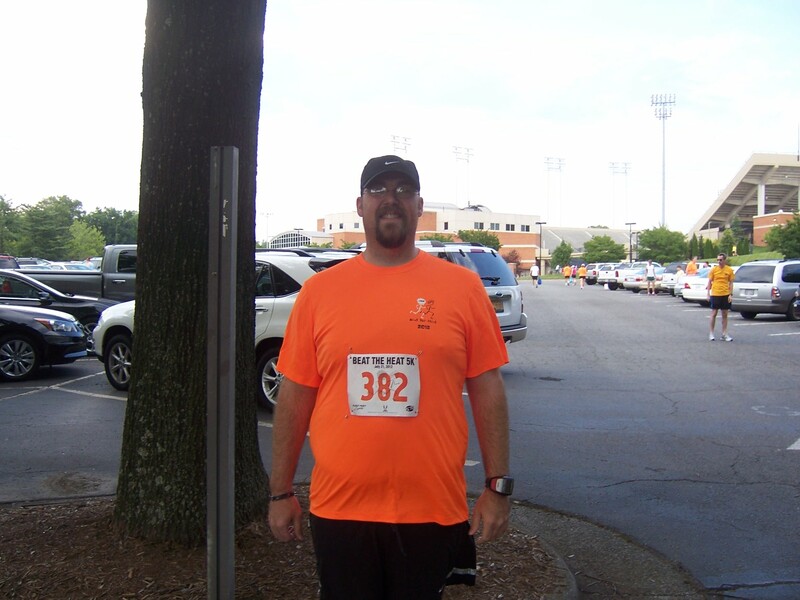 Weekly Recap 7-16-12 to 7-22-12 – 100 POUNDS LOST. I was going to do a separate blog post for this, but I figure since I’m doing my weekly recap today anyway, this will suffice. Usually the weight loss comments are last but today they will be first. I weighed in this afternoon after my yoga practice at 253.2 pounds. 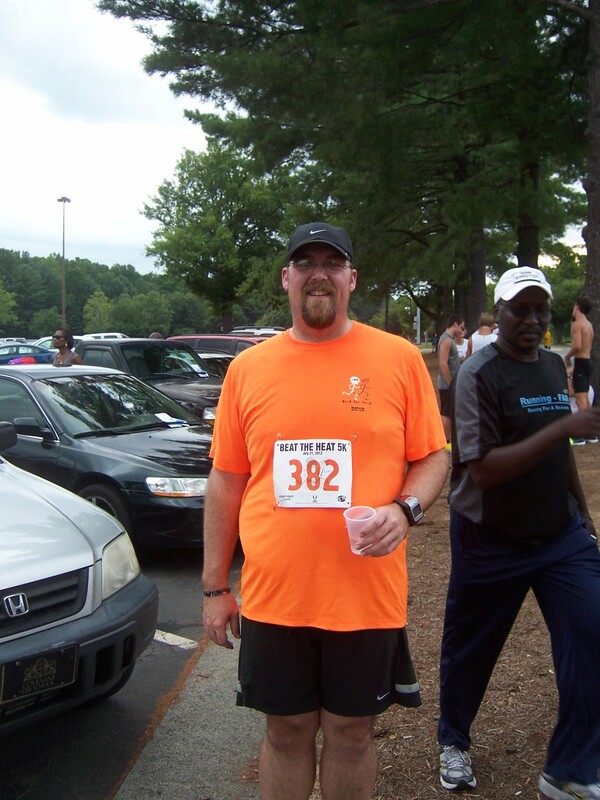 A loss of 101.8 pounds from my heaviest weight of 355 pounds in the August/September time frame of 2009. It’s been a long road, and a large chunk of it (55 pounds) has been from October 2011 when I joined MyFitnessPal to the present. My check in on MyFitnessPal, which of course makes it official. I feel better then I’ve ever felt in my life, both physically and emotionally. I’ve accomplished things I’ve never imagined in my wildest dreams. Even when I had registered for my half marathon and begun training for it, I still assumed it couldn’t be done. I don’t remember exactly when I joined DailyMile and started logging my running (or walking as it started out), but I’ve logged 626 miles on DailyMile in total, and 370 miles (all running) this year alone. My goal is 732 miles for 2012, which is 2 miles per day. I may not reach it, as the end of the year gets closer we will see, but I should get close. Now a look at this week. No missed workouts this week, which is good, and with adding the light weight lifting to my Friday rest day (rather than Saturday after my run or Sunday after yoga) I’m now up to working out 7 days a week. Something I would have also never imagined in my wildest dreams. I was active in High School with marching band and playing ball with my friends, but certainly not a gym rat. There are a lot of different challenges in distance running. Distance challenges (how far can you go), time challenges (how fast can you go), course challenges (hills, trails, pot holed roads) and environmental challenges (heat, snow, rain, ice). This race is not a terribly difficult course, but the timing of it is brutal. Definitely an environmental challenge. I very nearly signed up for this race last year until I realized that Beat the Heat was not an invitation, but a challenge. Can you beat the heat? Despite being in the evening it was still very warm and with rain threatening, very very humid. It was 89 when I left my house, but I don’t know what it was at race start. It was cloudy and a little bit of a breeze but still quite warm. Smiling pre-race. My running buddy Jen who is sidelined with a bum hip right now was at the race as a volunteer and she took all these photo’s. 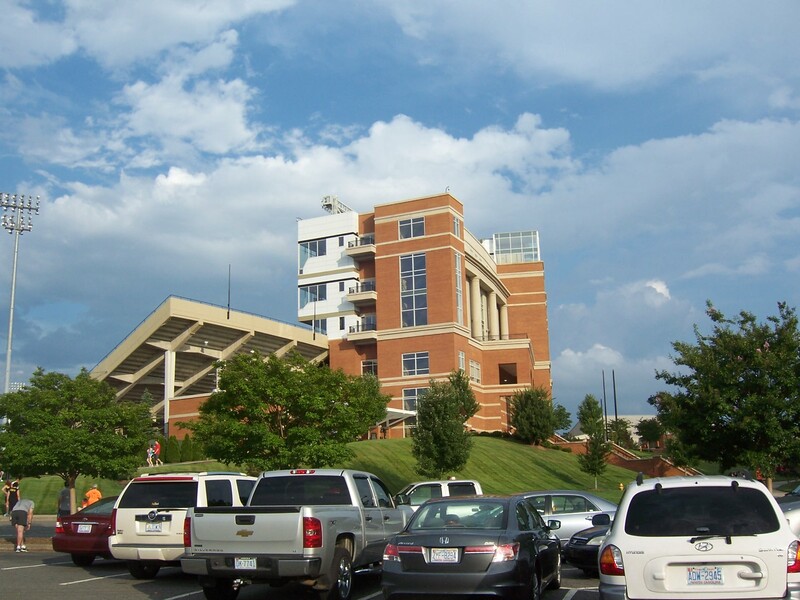 The race was hosted at the Wake Forest University football stadium and the roads around it. Nice venue, relatively flat (345 ascent, 354 descent). This is a serious race. 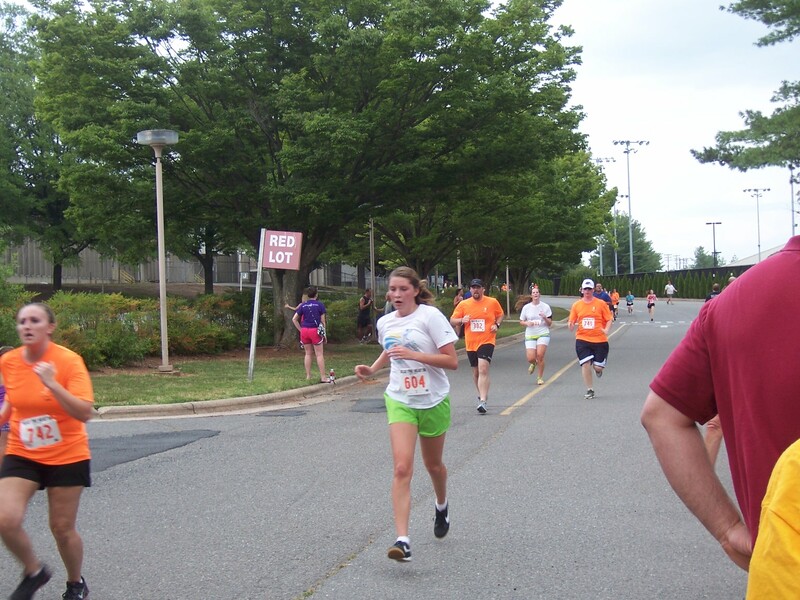 This race is the US Track and Field North Carolina 5K championships with prize money and everything. Sadly, but stoically the young girl who won the age graded placings had to defer the prize money because she is a high school athlete and has to keep her amateur status. Still very impressive for a 16 yr old girl with a bright career ahead of her. 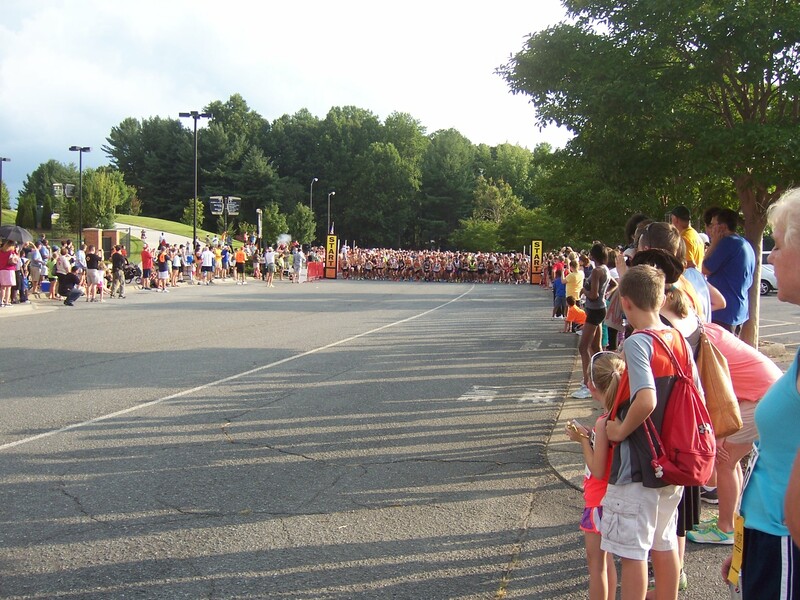 There was a huge crowd for this race, about 1000 people. It was about the same as my starting corral for the New Orleans half marathon, which were about 1000 people each (plus or minus those who shifted corrals). A lot of dodging and weaving at the start and it didn’t really thin out until about a half mile. I’m in there somewhere, I promise. They had three “corrals” so to speak at the start line. Elites and USTAF people up front, then under 20 minute finishers, between 20 and 30 minute finishers and then over 30 minute finishers. 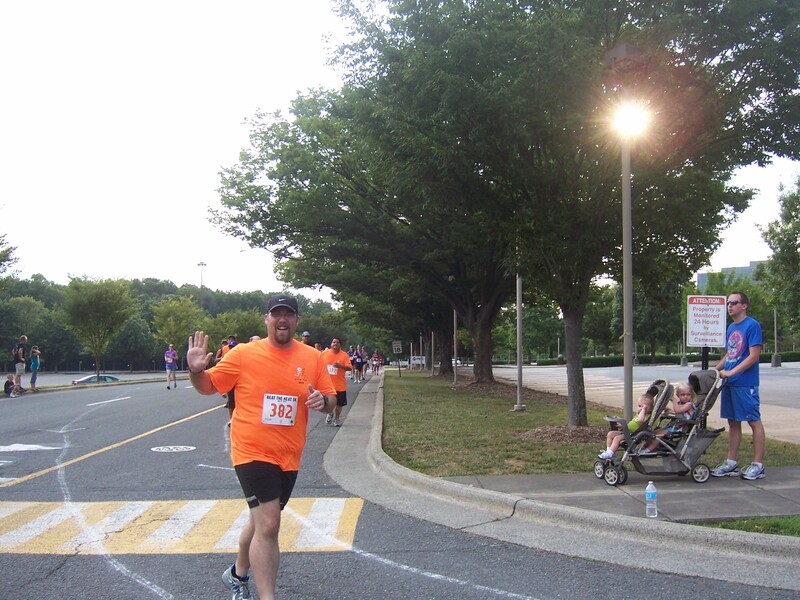 My PR is 34 minutes, and so I didn’t want to be all the way back in the back with the walkers and strollers to start out with, so I tried to start as close to the front of the “over 30 minute” group as I could. I started off as always pretty fast, caught up in the crowd and the excitement of race day. Given the extreme conditions I planned on running this race slowly, with the goal of just finishing. I was very surprised to tick off a 10:36 first mile, but I knew I couldn’t hold that pace, but I did a good job holding miles 2 and 3 at a steady pace 11:41 and 11:49 respectively. But I got a surprise as I loaded the Garmin at home. I covered the last 0.11 miles in 1:04 which is a 9:52 pace! WOW. I wasn’t trying to kick or push to the finish, but I guess my feet just went crazy. Ran into Jen on the course at about 1.25 miles, she was almost too busy enjoying her beer to snap a picture but she managed to catch a couple of me. Pushing hard to the finish with my unconscious kick. Finished up the race with a nice post race dinner of pizza and beer (after I sat down for a while and cooled down since I didn’t feel so hot immediately after the race). Was not a PR, but wasn’t too far off. 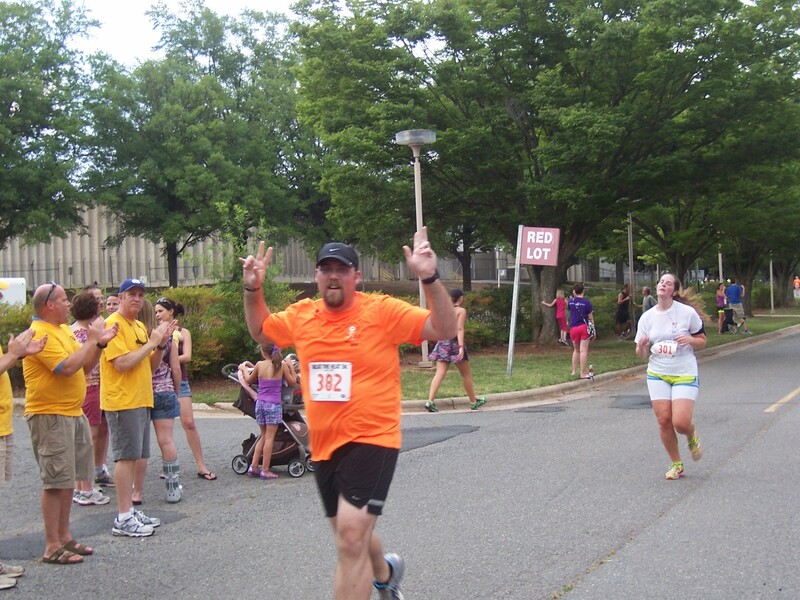 Still smiling post race…. always a good thing. I just finished the book Once a Runner by John L. Parker Jr. The book was a gift from my brother and his fiance who sent it to me along with a signed copy of Jeff Galloway’s Marathon! I had not heard of this book and I’m just starting to get into “running” books. The back cover of the book lists it as a “must read for all runners” and I have to say I totally agree. This is a fantastic book. While this is a fictional story, it’s written by a runner, inspired by his fellow runners and has a lot of “truth” in it. There is enough technical jargon to make you feel like you are training right alongside these guys and but also enough of the human element as the main character struggles to balance his quest to be the best in the world with school, life, love and everything else that goes along with it. The book is set in the 70’s and there is some references to the Vietnam war and protests and long hair and disco music, but really this could be any place at any time and it would still be the same story. It fits in as well in present day as it did back then. And that’s one of the endearing themes of the book as well. 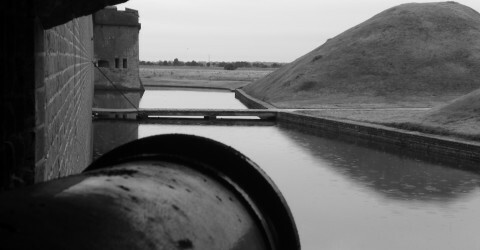 Running is something that is hammered into stone for all time. The results are always there to look back on. One of the things that struck me as funny but so true is how runners are so obsessed with numbers. The runner in the story was known for running a 4 minute mile, but he would always point out that it was 4:00.3 (or verbally, four flat point three). He reduced that to 4:00.1, but still not under 4 minutes. But that 2 tenths of a second was a HUGE difference. For the recreational runner, we don’t get our times and records set in stone the way the college and Olympic runners in the story do, but this is how we are with our PRs. If we shave off even a few seconds off our best time it’s a huge accomplishment and if we reduce it by minutes that’s just unbelievable. This was a fantastic read, and I’m already looking forward to the next book Again to Carthage once I can get my hands on it. Highly recommend it! Well I had another kind of rough week, got into a midweek funk that I pulled myself out of by the weekend. I skipped yoga on Wednesday because my knee was hurting, and frankly didn’t feel like going. Felt awful on Thursday and forced myself to do a miserable 2 miles on the treadmill. Friday I went to lift weights and then my Saturday long run was a struggle, but not because of how I felt, just long 5 miles in some brutal humidity. Ok, so normally I get worried with a big loss since the next week is usually a gain, but I think is this case, this is an adjustment from last week’s gain which was from bad food and alcohol and probably a lot of salt levels/water retention etc. So it melted away as my body adjusted back to normal, and then tacked on a normal loss on top of it. The exciting part? This puts me at 1 pound away from 100 pounds lost. I’ve been trying to break through this wall for over a month and I knew it was gonna give me a struggle, but maybe finally, finally it’s coming off. NSV (Non-Scale Victory) of the Week: I went to donate blood after my tuesday run. (I knew better than to donate before). I asked the ladies if this was OK since I was obviously fresh from working out, dripping sweat.. they said it was fine, just make sure I hydrated. So I drank several cups of water before they called me back. Being a bigger guy, and also being 0+ they always ask me to do double units. The last two times I’ve donated I’ve been rejected for my iron being too low. This time my iron was way high enough to give doubles, so NSV #1, a huge indicator of my better, healthier eating habits. Second, after I donated, I walked over to the canteen area, did not feel woozy at all, and so I sat and drank my small cup of soda, ate my cookies, made sure I sat for a few minutes and then left. In the past, I’ve always felt fine after I sat a minute, but have been a little woozy straight out of the chair, and that was only giving a single unit. So NSV #2, I’m healthier, and better hydrated as well! Thank you to cPT_Helice on MyFitnessPal for posting this.. I had to steal and share. I AM A RUNNER because my shoes are training equipment, not a fashion statement. The best shoe for me is the one that makes me a better runner. I choose the shoe that goes with my running mechanics, not my running outf…it. I AM A RUNNER because I don’t have running outfits. I have technical shirts and shorts and socks. I have apparel that enhances the experience of running by allowing me to run comfortably. I can say “Coolmax” and “Gore-Tex” in the same sentence and know which does what. I AM A RUNNER because I know what effort feels like, and I embrace it. I know when I’m pushing the limits of my comfort and why I’m doing it. I know that heavy breathing and an accelerated heart rate–things I once avoided–are necessary if I want to be a better runner. I AM A RUNNER because I value and respect my body. It will whisper to me when I’ve done too much. And if I choose to listen to that whisper, my body won’t have to scream in pain later on. I AM A RUNNER because I say I am. And no one can tell me I’m not. I’m not a huge proponent of the “Organic” movement. I don’t particularly see the need for it. I don’t think there is anything wrong with organic farming per se, but here are a few things that I’d like to point out. I’ve been mulling on this for a while and I finally wanted to get around to putting it to words. This is merely my opinion, based heavily on my food science education. Ok, while this in of itself is not a bad thing, look at what is missing from that statement. Organic farming is not designed to improve a food’s quality, quantity or nutritional value. “Quality” as far as no pesticides or whatever, is debatable, but also a very personal thing, but a tomato is a tomato. Just by it’s very nature. You don’t use pesticides, insects eat your crops. You don’t use fertilizer, your plants don’t grow as big. Organic farming is slower, less efficient and more wasteful. This is why they cost more. Not because it’s more expensive to grow. And also because it’s trendy and people will pay 12$ a pound for apples. You can argue all you want about “pesticide residues” and “chemical fertilizers”, any presumed health benefits of organic foods is purely anecdotal and not yet supported by any hard science. Since pesticides tend to be the battle cry, even conventional raised foods have pesticide residues well below the limits of safety. Also, these pesticides are designed to kill or deter one specific insect leaving other insects and larger animals unharmed. It’s very easy to disrupt the simple systems of an insect, but this is not going to have any impact what so ever on a more complex mammal such as a rabbit, a deer or a human. Let’s be honest. There are 7 billion people on this planet that need to eat. Regardless of the farming methods, 10 tons of rice per acre is better than 4 tons of rice per acre. Countries that have a food surplus (US, UK, Japan, Australia) can have regulations to throttle down and restrict food production. Other countries can’t afford to do this. They have to produce as much food as they can by any means necessary. Organic farming produces as low as 50% of the yield of conventional farming, and that doesn’t bode well for starving people. One caveat I will add is there is benefit to buying local, organic or not. I’ve made it a point to buy more things sourced locally since even if they are conventional, they will be better than organic shipped in from South America. And I buy things from North Carolina as much as I can, but also just things from the US. I buy apples from Washington State. I did not buy the same apples (Galas) that were from Chile. Why should I? Yes, some things don’t grow in the US at all (bananas come to mind) and other tropical fruits that grow in Hawaii (pineapples, mangoes) and no where else. So some stuff still has to get shipped on a plane/boat/train. But buy local when you can. Feel free to read and educate yourself as well.